As expected, the Washington Redskins have officially released former star quarterback Robert Griffin III. 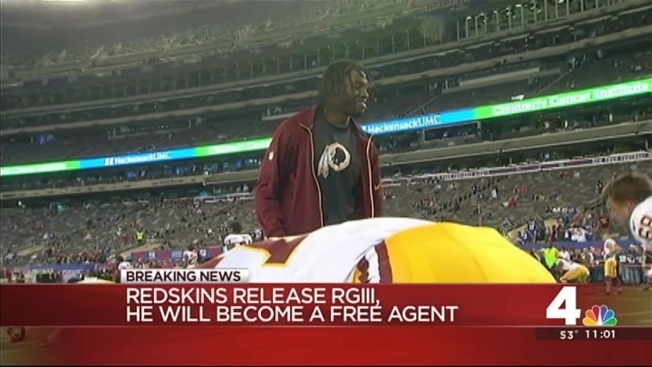 CSN Redskins reported the news about Griffin Monday morning. Griffin was inactive for nearly the entire season, only getting into his uniform once when injuries decimated the team and they needed to have the requisite players suited up. Monday morning, Griffin tweeted, "We have to face the challenges life presents and never back down. Keep Fighting!" We have to face the challenges life presents and never back down. Keep Fighting! He followed that tweet with a "thank you" to his fans. Griffin was the No. 2 overall pick in the 2012 draft, then earned NFL Offensive Rookie of the Year honors. But injuries plagued the remainder of his time with the Redskins. Last week, the Washington Redskins placed a non-exclusive franchise tag on Cousins. A source told News4’s Carol Maloney there is a chance of getting a long-term deal signed by July 15.